A NEW Tamworth band are coming out of the wilderness and into the limelight. Wilderness Laine were formed way back in January and after nearly 12 months of preparation are now ready to hit the road. And they should become one of the most …combos on the Tamworth scene, for their style is almost totally different to any of the current crop of bands. At the moment they are working around a nucleus of nine or ten self-penned compositions ranging from vaguely folky ballads to hard rock. Much of this material is based around 12-string acoustic guitars something which could cause sound problems when they start playing live. Some numbers even feature Suzanne Cleall, a flautist, which shows the diversity of their material. ONE of Tamworth’s most interesting young bands, Wilderness Laine, play at the St. John’s Guildhall tonight. WL made their debut last year and have spent their time since then trying to iron out the technical problems caused by their semi-acoustic approach. Recently they played a trouble-free behind-closed doors set at the Guildhall and are hoping for a similar hitch-free evening tonight. “Dear Fluff…Love the show especially the classical interludes between the album tracks. More Genesis, Yes, Floyd, Barclay James Harvest, Supertramp and Gentle Giant please, not forgetting Tangerine Dream and PFM of course. Those of you who learned their music after 1976 will have to forgive me for that brief whim of nostalgia. That time of concept albums, Roger Dean and embroidered t-shirts was brought back to life when Wilderness Laine play at St. John’s Guildhall. There were few or no technical gremlins to mar their display, and the only bad spot was Andrew Thompson’s sixth-form ‘in’ jokes with a section of the crowd between numbers. Star performer was ace guitarist Sean Keogh who played a solo of stunning ability during “In and Out” and wrung some marvellous weird noises from his silver strat during “Wilderness Laine”. The 70s are dead – long live the 70s. Former Wilderness Laine guitarist Sean Keogh has just become the area’s first rock and roll doctor. For Sean, who was a very talented songwriter, passed all his medical exams a couple of weeks ago and now holds the Doctor prefix. It means he will be swapping his Stratocaster for a stethoscope and we wish him the best of luck as he carves his way into his new career. 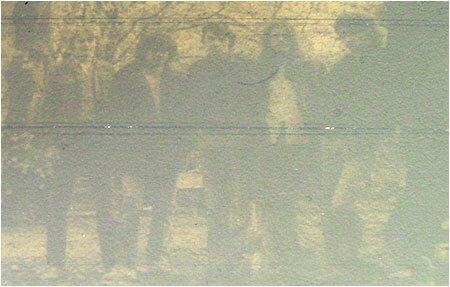 Wilderness Laine…left to right: Cliff Jones, drums and percussion, Sean Keogh, lead guitar; Ian MacIntyre, bass; Joe Czernuszka, guitar and Andrew Thompson, vocals. The full profile and history of Wilderness Laine has yet to be added to TamworthBands.com Call back soon to read the full band details.